This quiz is composed of some essential knowledge needed for the success of your course planning. the success of your course planning and course selection. Test your readiness and best of luck! Congratulations, you are ready for your first year! If you have any question regarding course enrolment, feel free to ask them on UofT Tips! As a first year student, what date do I enrol in my courses? You can start viewing your course start time on July 20th and enrol on 26th. When enrolling in courses on Acorn, do I only enrol in courses for the first term (fall), or both the first and second (spring) terms? Make sure you enrol in courses for both semesters!!! If a course I wish to enrol in is full, what should I do? Check it every fifteen minutes to see if there is an available spot. Put myself on a waitlist for the course (if there is one). You can be waitlisted for a maximum of 2.0 credits. When a course I want to enrol in has a Priority enrolment control that I do not meet, what can I do? Try it on August 3rd once the "P" priority is removed. All hope is lost. Try looking for some other courses. Beg the department to let me in. The “P” priority is removed on August 2nd. On August 3rd I can try to enrol in the course. Every course code ends with a letter – either F, S, or Y. Example: “ENG140Y1 Y” or “CSC108H1 F”. What do these letters mean? They are only there for aesthetic purposes. F : class for first term (fall); S: class for second term (spring); Y: class for both first and second terms. Every course code also has a number such as 1 or 3 or 5 before the F/S/Y indicator. Example: “MAT135H1F”. What do these numbers mean? They represent the level of difficulty of a course. The higher the number, the more difficult the course is. The numbers represent the campus on which the course is offered. Specifically: 1 = A course offered on the St.George Campus. 3 = A course offered on the Scarborough campus. 5 = A course offered on the Mississauga campus. Is “MAT135H1F” a 0.5 credit course or a 1.0 credit course? It's a half credit course. I can't tell. Maybe the upper year students can tell me during the orientation week. A 0.5 credit course has the letter “H” after the course name and number. 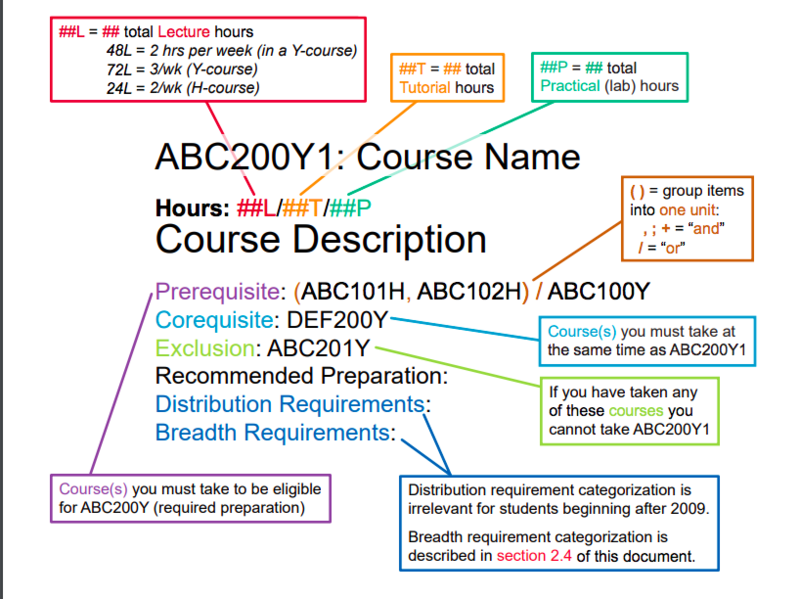 A 1.0 credit course has the letter “Y” after the course name and number. Are there courses exclusively for first-year students? First-Year Seminars (199s) and College Ones are small classes designed for first year students and for first year students only. What is the significance to my course enrolment of August 29th? It's the last day to transfer if I decided to go to Ryerson instead. Nothing will happen on that day; this question is just a bluff. I need to pay all of my fall term fees or have them officially deferred. Two friends of mine offered me two different views on Breadth Requirements. One tells me that I should take care of all my Breadth Requirements in my first year, so I can focus on my majors later. But the other one says I should focus on getting into my program first, and then take electives to satisfy breadth requirements. What should I do? Breadth Requirements should be fulfilled as soon as possible, so I don’t need to worry about them anymore. Breadth Requirements are a distraction. I should focus on my program first. Actually, both friends are correct, Breadth Requirements just need to be fulfilled before a student can be eligible to graduate. At which time they fulfill them is up to the individual student. Fulfilling the Breadth Requirements can be a years-long process but it can also be focused and completed at any point during your degree. It’s highly situational and more of a personal choice. Hi, there are two courses I want to take but there is no gap between them. I was wondering is it still possible for me to take them? Hi Jeri! Basically all undergrad courses at UofT start 10 minutes later than the hour, so that gives you 10 minutes to commute! And if the commute is far, you could always leave the class a little earlier!